These are not rare, but they are certainly uncommon. They also are typically Southern. 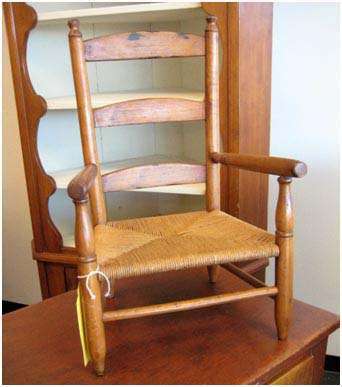 Southern collectors have long come to know the architecture of Southern chairs. The design clue that makes this chair especially Southern is the exaggerated overhang of the arms beyond the front leg stiles. Many examples can be seen on pages 52 through 71 of Hurst and Prown’s 1997 classic reference book, Southern Furniture: 1680-1830. More examples can also be seen on pages 116 through 121 in John Bivin’s The Furniture of Coastal North Carolina: 1700-1820. Both of these books are required reading for collectors of all things Southern. The surfaces of this chair have been cleaned and the woven seat is a replacement.